This is a retrospective of the last two months. 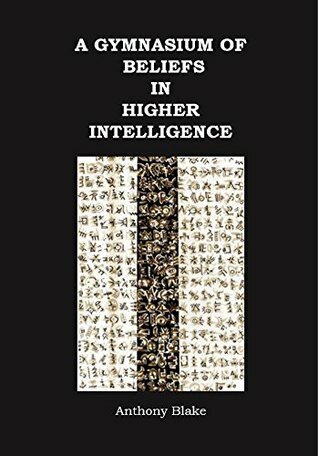 A Gymnasium Of Beliefs In Higher Intelligence by Anthony Blake. Many books claim all kinds of truths. This is not one of them. One theme throughout the book is that of illusion. Anthony Blake adopts the position that some things are not what they seem to be. He has studied physics and the philosophy of science, and had many conversations with David Bohm. Bohm influenced Blake a lot, especially with the idea that there’s no one true theory. The word gymnasium means a place of nakedness. Anthony Blake recommends that whenever a view is put forward—think of its contrary! A belief cannot include all possibilities, so at best is partial and provisional. Emotions reveal what bind us into a view of reality. Listen to all voices, especially when they contradict each other. Understanding means enabling one’s own mind to change. It comes out of the body and what we do. Intelligence is engaged in fact, while illumination comes from beyond fact and subsists in value. Anthony Blake proposes that when people coalesce their individual intelligences a higher order can emerge. One approach is through dialogue. Listening is an action of tremendous depth. It requires an act of receptivity. Such an act is much rarer than any act of assertion. Seriously listening to other people is next to impossible for many because even just allowing different views to pay a visit is felt to be akin to annihilation. 1. All members are equal in status. 2. There is no limit on what is spoken about. 3. The group operates from the content of the present moment. This requires a sensitivity to what is happening now. I find it most interesting, in terms of generative organizing, that there’s no presupposition of solutions in dialogue. This is very different from the approach of imposing a system. Dialogue is more than just clever conversation. In dialogue, there is no leader, no agenda, and no set procedure. Dialogue is making one’s way through meaning as it unfolds without prejudgment. The direction emerges from the group. Needless to say, members of the group can easily inhibit or distort the process. This is a thought-provoking book! 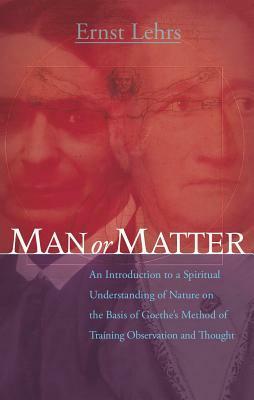 Man or Matter: An Introduction to a Spiritual Understanding of Nature on the Basis of Goethe’s Method of Training Observation and Thought by Ernst Lehrs. Johann Wolfgang von Goethe published his Metamorphosis of Plants in 1790. A mechanism can be taken to bits and re-assembled. An organism does not permit this. Goethe developed a clear distinction between two ways of observing the world, ascribing one to verstand (intellect), the other to vernuft (reason). Goethe discards the idea that measurement is absolutely superior to sense-perception. One of the first systematic pieces of work which Goethe undertook was to go through Newton’s Opticks: or, A Treatise of the Reflexions, Refractions, Inflexions and Colours of Light, sentence by sentence, recapitulating Newton’s experiments. Goethe’s examination of the Newtonian procedure showed him that to gain an explanation of natural physical phenomena, we must approach them through the way nature brings them into being. A source of illusion lies in the fact the onlooker consciousness accepts itself as a self-contained ready-made entity. The feeling of certainty and security arises from the exactness in mathematics. The price paid is that the scope of the enquiry into nature is narrowed. Goethe found access not only to nature’s quantitative secrets—but also to nature’s qualitative secrets. The book is interesting, but the translation into English is awkward! 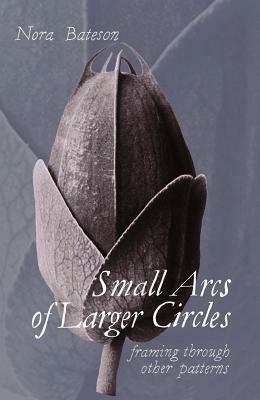 Small Arcs of Larger Circles: Framing Through Other Patterns by Nora Bateson. Nora Bateson suggests that we “see our world differently—as a living process, not as a mechanism” (Bateson, Small Arcs of Larger Circles, p.186). “The idea of systems” is from “the ’50s when cybernetics emerged” (p.95). “Cybernetics … found purchase in the larger culture’s … industrial and mechanistic thinking” (p.95). The “habit of applying the problem-solving methods of the engineer” is so pervasive that “the language of the entire body of systems and complexity theory has become a container for slightly higher order reductionist thinking” (p.188). The “traps of linear and causal thinking, the notions of control, and the mechanistic approach to life … is repeatedly evident in all aspect of our culture” (p.96). The “underlying metaphors” are based on “the logic of industrial causation and mechanized interaction” (p.31). “Life is not like that” (p.31). The “actions and decisions … we make … based on this limited view … of course lead to trouble” (p.31). Organisms lives within “the totality of patterns and relationships” (p.40). Complexity “demands a more engaged inquiry” (p.41). Nora Bateson often receives “a plea for a map, a method, and a technique” (p.77). But, “attempting to solve a problem by going at it directly is only occasionally effective” (p.77). “The problems we see are nested in contexts” (p.77). Strategizing “our way through becomes short-circuiting which is often destructive” (p.77). The “options that surface when viewed from a wider angle,” a broader context, “are entirely unplannable” (p.77). “Living systems … require more than one context of study if we’re to get a grasp of their vitality” (p.79). The “subjectivity of our perspective is what gives depth and in-form-ation to everything we see” (p.101). “Working and playing with the complex living world requires multiple languages, multiple ways of knowing” (p.205). There are “countless variables moving and changing in countless ways” in any “living system” (p.133). The “messy interaction with life” is not just “a method of making decisions—it is an aesthetic” (p.139). Nothing can be “more practical than to become more familiar with the patterns of movement that life requires” (p.140). I agree with Nora Bateson that the “lens through which we see systems theory or cybernetics or complexity will influence what we do with it” (p.95). The lens may still be an old one even though the language is new. This is a personal and beautiful book! Enjoyed reading it. 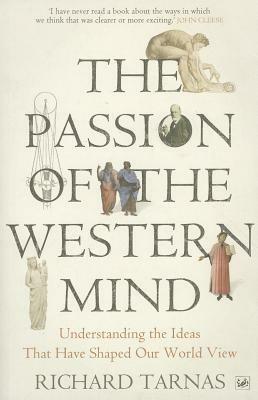 The Passion of the Western Mind: Understanding the Ideas that Have Shaped Our World View by Richard Tarnas. Richard Tarnas believes that “only by recalling the deeper sources of our present world and world view can we hope to gain the self-understanding necessary for dealing with our current dilemmas” (Tarnas, The Passion of the Western Mind, p.xi). Every generation must, furthermore, “examine and think through again, from its own distinctive vantage point, the ideas that have shaped its understanding of the world” (p.xii). Between “the mid-fifteenth and early seventeenth centuries, an unmistakable quantum leap was made in the cultural evolution of the West” (p.247). The “basic conception of the physical universe as an atomistic system ruled by a few mechanistic laws became the guiding model for the seventeenth-century scientists” (p.268). Although Newton’s “concept of gravity as a force acting at a distance” seemed “insufficiently mechanical … the mathematical derivations were too spectacularly comprehensive not to be compelling” (p.270). The “Newtonian-Cartesian cosmology was now established as the foundation for a new world view” (p.270). “Descartes used Galileo’s distinction between primary, measurable properties of objects and secondary, more subjective properties” (p.278). “In Descartes’s vision, science, progress, reason, epistemological certainty, and human identity were are inextricably connected with each other and with the conception of an objective, mechanistic universe” (p.280). As the “Cartesian-Newtonian framework was drawn out to its logical conclusions, the implications … were gradually made explicit” (p.285). The “universe was an impersonal phenomenon, governed by regular natural laws, and understandable in exclusively physical and mathematical terms” (p.285). “The structure and movement of nature was the result of … an amoral, random, and brutal struggle for survival” (p.285). The “purpose of knowledge … was to better align nature to man’s will” (p.295). The “Scientific Revolution and the Enlightenment brought Western man unprecedented freedom, power, expansion, breadth of knowledge, depth of insight, and concrete success” (p.325). And yet “simultaneously served … to undermine the human being’s existential situation on virtually every front: metaphysical and cosmological, epistemological, psychological, and finally even biological” (p.325). With “Galileo, Descartes, and Newton, the new science was forged” (p.236). And yet “simultaneously, the new world was disenchanted” (p.236). “The new universe was a machine, a self-contained mechanism of force and matter” (p.236). Science’s “quantitative analysis of the world … was accompanied by the … diminuation of all those qualities … constitutive of human experience” (p.236). “Reality may not be structured in any way the human mind can objectively discern.”—Richard Tarnas, The Passion of the Western Mind, p.359. “In contrast with … the Enlightenment, the Romantic vision perceived the world as a unitary organism rather than an atomistic machine” (pp.366–7). “In a world made mechanical and soulless by science, the pursuit of beauty for its own sake assumed extraordinary psychological importance” (p.373). Goethe “strove to unite … observation and … intuition into … a science capable of grasping nature’s organic archetypal forms” (p.378). “The scientist could not, in Goethe’s view, arrive at nature’s deeper truths by detaching himself from nature and employing … abstractions to understand it, registering the external world as a machine” (p.378). “Bohm’s theory of the implicate order” and “Bell’s theorem of nonlocality” point to new possibilities for a “less reductionist scientific world conception” (p.405). “Evelyn Fox Keller’s … recommendation … of empathic identification with the object … reflects a similar reorientation of the scientific mind” (p.405). The challenge is to engage the “set of perspectives which brings forth the most valuable, life-enhancing consequences” (p.406). The “great irony” is that when we “actively construes the world as unconscious, mechanistic, and impersonal, it is just then that the world is completely a selective construct of the human mind” (p.432). This is a very well-written book, which took ten years to write! 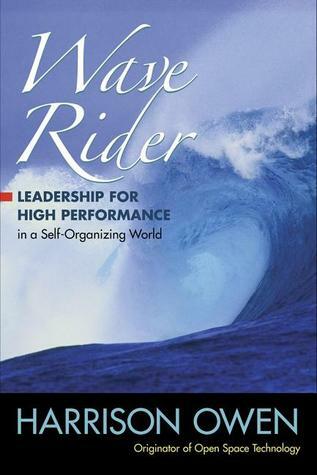 Wave Rider: Leadership for High Performance in a Self-Organizing World by Harrison Owen. Harrison Owen’s “operating hypothesis” is that “self-organizing systems are naturally productive … of superior performance” (Owen, Wave Rider, p.xvi). The argument of the book is that “our organizations, as indeed the entire cosmos—are all self-organizing systems” (p.6). “Not just a little bit, … but from beginning to end, top to bottom” (p.6). This means that “a large part of what we currently devote a good deal of time and energy to—organizing things—is wasted effort” (p.6). By “imposing our view of organization on a self-organizing system we essentially throw a spanner in the works” (p.7). Organizations work despite our organizing efforts. “The image of the Wave Rider comes from the world of surfing” (p.7). The objective is “to ride the wave … until you reach the beach” (p.8). For “every beginning there is an end” (p.34). “The simple truth of the matter is that as chaos, confusion, and conflict do their work, things come and go” (p.34). All three “seem to be essential to living, and therefore their elimination would do substantial damage to life” (p.31). Difficulty arises when “life is downsized (at least in our thinking) to that which is observable and under our control” (p.40). 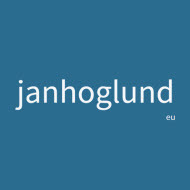 “Not only is everything radically connected, but it is all moving, and with every move the nature and impact of the interrelationships can change” (p.49). “We are dealing with something of such magnitude, complexity, and changeability that even thinking about it creates massive overload” (p.52). The “significant difference” here is that “structure and controls … are emergent, which is to say that they emanate from the group as a whole and therefore are appropriate to the people…, the task…, and the environment” (pp.75–6). “When caring people gather around something they care about, there is a high likelihood that useful things will happen” (p.79). In short, everything is self-organizing, “even and perhaps most especially, all those things we thought we organized and must control” (p.233). Effective work “emerge naturally from the people themselves, all in tune with the task undertaken and the environment” (p.132). Authentic leadership “emerges from the passion and responsibility of those who care…, creating focus and direction for the emergent organization, and a nutrient space in which that organization may grow” (p.132). This is a great book! Harrison Owen is one of my favorite authors. Here is my review of The Spirit of Leadership: Liberating the Leader in Each of Us, which is another of Harrison Owen’s books. 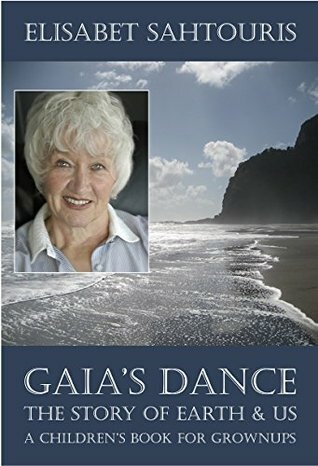 Gaia’s Dance: The Story of Earth & Us by Elisabet Sahtouris. Elisabeth Sahtouris is among the scientists changing their views from a non-living to a living universe. Gaia’s dance is what we have come to know as Earth’s evolution. We are all part of Gaia’s dance, so the more we learn about it, the more we learn about ourselves as people of Earth. A machine is created from the outside by someone who puts its pieces together in just the right way to make ti do what is wanted. A living being creates and continually keeps renewing itself. When something goes wrong with a machine, it must be repaired, while a living being often can repair itself. Co-evolution happens as organisms try out all ways of life in Gaia’s dance. The knowledge how to co-operate is there in both bees and flowers, as in the rest of nature. Life organizes itself in intelligent and mostly co-operative ways. Ecosystems are made of countless different kinds of organisms all working together with no one of them in charge. The old, mechanical way, of looking at the world, with organisms simply evolving by accidents which fit or didn’t fit them into their contexts, is just too simple a view. Organisms improvise and make it up as they go, using their intelligence to work out whatever problems come in their way, correcting imbalances so that all can dance together. The human history is a story of competition and cooperation. Learning to co-operate well has been most important from the very beginning. Human society was, and still is, in a competitive expansion phase with corporate empires now larger than most nations. The problem is that we have left out some of the most important things in a co-operative society: the equal role of women, the concern for future generations, and the need to give back to nature for everything taken from it. Human co-operation is necessary now for our survival. Being creative, greedy, and mean to each other worked to get us to where we are, but are now out of step with Gaia’s dance. Just how we work things out is not so important. What matters is that we do it in a way that works for everyone. Instead of hating each other, we can help and learn from each other. It seems as we need the challenge of immense disasters to get creative enough to wake up and act. This is a thoughtful book! 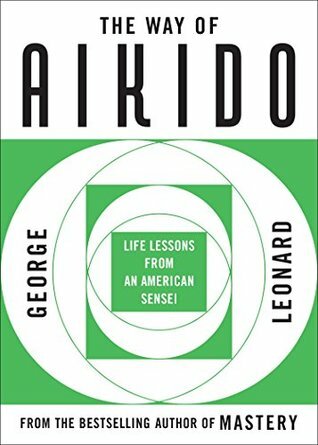 The Way of Aikido: Life Lessons from an American Sensei by George Leonard. The very essence of aikido is contained in the blending move. The aikidoist moves toward the attacker. In this position, he or she is looking from the attacker’s viewpoint—without giving up his or her own viewpoint. This blending move multiplies your options. Blending isn’t the answer for every situation, but it can multiply your options. It’s important that you are firmly connected to the earth, with your energy concentrated in your hara (center), as you blend. To blend consistently under pressure requires practice. Blending is an expression of the willingness to embrace even the strongest attack, and to bring it into concord with the unity of the universe. The physical techniques in aikido are only the surface manifestations of a more profound reality. Each of as can be viewed as a context of the universe from a particular point of view. Each of us can act as if we are at the center of existence—allowing others the same privilege. To do so we must get in touch with our own center. The impetus of our actions must arise in our center. All you have to do is put you attention on the hara, but the ramifications of centering can take a lifetime to play out. While physical centering is always a pre-requisite, there’s also centering in non-physical activities. To see, breathe, and move from the center can change our lives. Physically, as well as symbolically, the hara can be treated as the center of power. Centering affects the outcome of our actions in many ways. And as the pressure increases, the difference between the centered and uncentered states becomes more apparent. To be centered is to say yes to life. Being willing to own your life creates a context that is almost sure to enhance it. A context isn’t just a passive container for our experience. It impels and directs our thoughts, emotions, and actions. It deals with how we weave our experience together to give it meaning. Context can limit and it can liberate. Changing context opens up new possibilities. It is ours to change. Executing techniques is not the end of the process. It is the beginning of the next action. When we become aware between techniques, techniques improve. When we approach an activity in the spirit of play—joyfully, for its own sake—we are likely to achieve the best results. This is a great book! The aikido philosophy translates surprisingly well into guidelines for living. 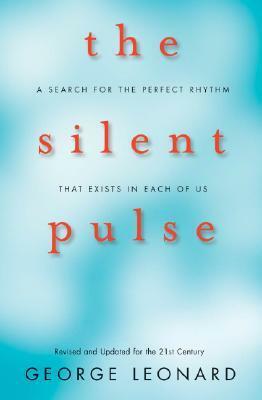 The Silent Pulse: A Search for the Perfect Rhythm that Exists in Each of Us by George Leonard. This book is about the underlying rhythm that sustains life and underlies all of existence. There exists a silent pulse of perfect rhythm at the center of our lives. Getting in touch with this rhythm can transform our personal experience and alter the world around us. Rhythm is a fundamental aspect of organization. The process of entrainment is the essence of human communication. A variety of bodily processes become synchronized through close interaction. The more you move in rhythm with someone, the close you become with that person. This is true not only with human beings but with all living organisms. Entrainment is made explicit in music. The performer’s movements must be perfectly entrained with the pulse of the music, or else the performance falls apart. Human beings have an ability to sense, feel, and move as one. Watch the members of a chamber group—how they become as one. Every creative act, every act of interaction, has its own movements, which can be suppressed only at the expense of what is spontaneous, and ultimately nourishing. At the heart of life, there is this silent pulse of perfect rhythm. It is our most accessible entry into the dance of Gaia, the dance of the universe. This subtle dance joins us to the world. At the heart of the world, there is only the dance. How arrogant it is to think that we can stand alone apart, against the world. We are part of all that we perceive. It appears that objects are to be known by their relationships rather than by any independent, fixed character. The idea of an individual human identity can be expressed through a distinctive inner pulse. The senses are means of connecting the organized rhythmic fields that we call the self with all the rhythms of the world. But our connectedness with the world goes beyond the sensory. It is built into our very structure. Mind and matter do influence each other. Everything that happens everywhere is somehow connected. Every part of the universe in some sense contains the whole. You might think of yourself, not only as a series of rhythmic fields within fields, but also as a series of holoids within holoids. Just as you have identity, you also have holonomy. The very structure of your body and being may be said to reflect the ongoing structure of the universe. The physically expanding universe is also a universe of evolution, transformation, and expanding possibilities. And the predominant direction of this evolution is toward increasing complexity and order, with new information, new options manifesting themselves at every point. The relationship between identity and holonomy is always going on, a silent pulse at the heart of our experience. We are continually influencing our universe through our own intentionality. The present moment always contains an element of genuine novelty. The universe is continually at work of restructuring itself. Our key choice is whether to become aware of and take responsibility for the power of our intentionality. A truly centered person feel no need to exploit others for selfish purposes. Each of us is a context, a weaving together of universal information from a particular point of view. We are not mere observers, but are always active participants at the feast of life. .
Each of us is in the universe, the universe is in each of us. 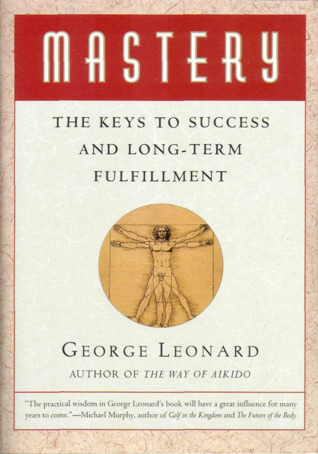 Mastery: The Keys to Success and Long-Term Fulfillment by George Leonard. George Leonard writes that mastery “resists definition yet can be instantly recognized” (Leonard, Mastery, p.5). Mastery “comes in many comes in many varieties, yet follows certain unchanging laws” (p.5). “It brings rich rewards, yet is not really a goal … but rather a journey” (p.5). The quick-fix mentality that pervades our society “not only prevents us from developing our potential skills but threatens our health, education, [and] relationships” (p.6). “Again and again we are told to do one thing only so that we can get something else” (p.39). “We spend our lives stretched on an iron rack of contingencies” (p.39). “The achievement of goals is important” (p.39). But the juice of life “is to be found not nearly so much in the products of our efforts as in the process of living itself, in how it feels to be alive” (p.39). Goals and contingencies “exist in the future and the past” (p.48). “Practice, the path to mastery, exists only in the present” (p.48). “Our preoccupation with goals, results, and the quick fix has separated us from our own experiences” (p.141). To put it more starkly, “it has robbed us of countless hours of the time of our lives” (p.141). Excessive use of external motivation can “slow and even stop” our “journey to mastery” (p.137). “The ultimate reward is not a gold medal but the path itself” (p.138). This book is okay, but I think George Leonard’s books on The Way of Aikido and, especially, The Silent Pulse are better (see above). 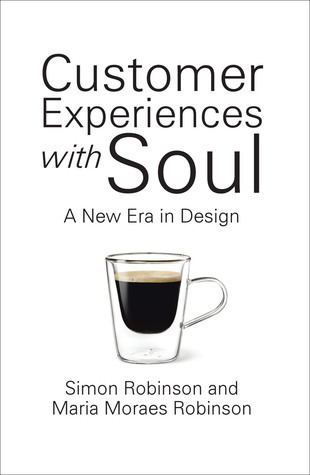 Customer Experiences with Soul: A New Era in Design by Simon Robinson (@srerobinson) and Maria Moraes Robinson (@DoraMoraesR). I am a very active reader. I need to become more active with my own writing. There’s as big difference between intrinsic vs. extrinsic organization/structure/order as there is between intrinsic vs. extrinsic motivation. An example of belonging together (Henry Bortoft, Taking Appearance Seriously, p. 21) is Harrison Owen’s genuine community (Owen, Wave Rider, pp. 76, 132). An aikidoist (George Leonard, The Way of Aikido) is a wave rider (Harrison Owen, Wave Rider). Dialogue (Anthony Blake) is a way to open space (Harrison Owen). “I need to become more active with my own writing.” ~ Yes really! I really enjoyed the width on this, and look forward to seeing how these strands mingle. I think we share an interest in how themes emerge and spread, so I’m going to follow you on Twitter, lest I miss the next instalment! But I got re-energised by your work, and so wanted to thank you personally. Hence this.